Anyone who’s read the books in George R.R. Martin’s massive A Song Of Ice And Fire series expects that certain changes have to be made when adapting it for television. At first, these changes were pretty minor—like aging the younger characters up a few years, or referring to the antagonistic killer ice zombies primarily as “White Walkers” rather than “Others.” As the show went on, these little alterations started to pile on top of each other, until eventually, bigger ones were needed—like excising two characters completely from the upcoming fifth season. 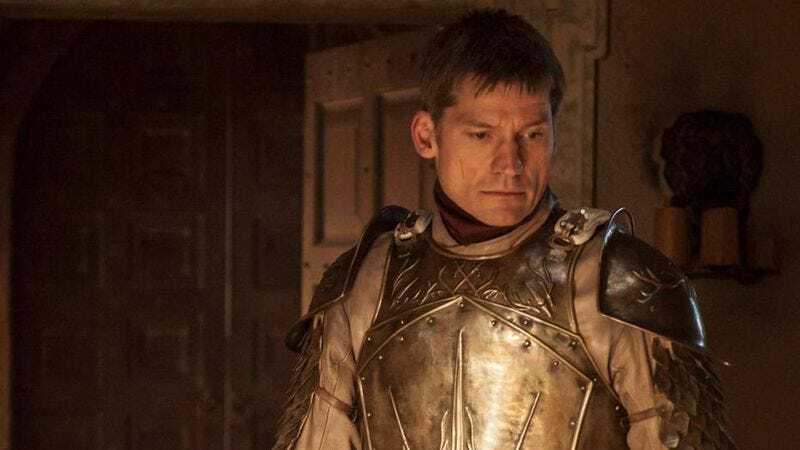 And now MTV News reports that the new season could see a major story shift for Jaime Lannister, everyone’s favorite one-handed knight. The fifth season of Game Of Thrones will be based on A Feast For Crows and A Dance With Dragons, the fourth and fifth novels in Martin’s series. In those books, Jaime Lannister heads to the Riverlands at the behest of his sister to quiet any remaining pockets of rebellion. But a recently leaked video from the set suggests that the show will instead send him to Dorne, the homeland of the dashing, daring, and newly faceless Oberyn Martell. In the video, Jaime is seen sporting one of the flowing, airy garments Oberyn was fond of wearing last season. He sits down with Ellaria Sand, Oberyn’s bereaved paramour, and an actor who’s presumably playing Prince Doran Martell, the ruler of Dorne. Doran Martell is known for, among other things, almost never leaving Dorne due to an advanced case of gout, and has been called a “major new player” in the coming season. As of now, Jaime has not come into contact with him in the books, nor has he gone to Dorne. While it’s difficult to state conclusively just what this video means for Jaime in season five, it does line up with a previous story about an actress auditioning for the role of Obara Sand, one of Oberyn’s daughters. In her audition tape, the actress’ dialogue revealed that Jaime Lannister “has been sighted sneaking into Dorne.” If true, this is one of the show’s biggest departures from the books yet, and suggests that the producers have grown tired of waiting for Martin to finish the series and have decided to just go their own way. Tracing the spider-webbing consequences of this decision will hopefully keep fans busy until the show returns next year.